Edit: Due to the fact that this article is old, the installation instructions may not work anymore. In order to successfully install the latest version of Skype, please access the skype tag and open the latest article (the one on top). Hello Linux Geeksters. As you may know, Skype 4.3 has been recently released, coming with a new user interface and improvements for the Skype client. Among others, it got support for cloud-based Group Chat, the file transfer support when using multiple devices at once got enhanced, support for PulseAudio 3.0 and PulseAudio 4.0 has been added while the support for Alsa has been dropped and the accessibility for blind and visually impaired users has been improved. 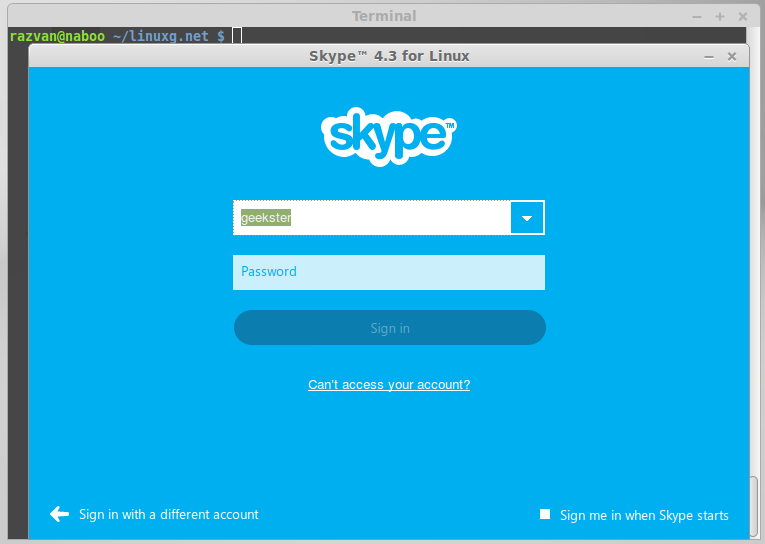 In this article I will show you how to install Skype 4.3.0 on Ubuntu 14.04 Trusty Tahr, Ubuntu 13.10 Saucy Salamander, Ubuntu 12.04 Precise Pangolin, Linux Mint 17 Qiana, Linux Mint 16 Petra, Linux Mint 13 Maya, Pinguy OS 14.04, Pinguy OS 12.04, LXLE 14.04, Elementary OS 0.3 Isis, Elementary OS 0.2 Luna and other Ubuntu derivative systems. Because it has not been added yet to the Canonical Partner repository, we have to download the deb package from the skype website and install the package by hand. Optional: Due to the fact that Skype is an application created for 32 bit systems, on 64 bit versions of Ubuntu it may use the Clearlooks theme by default, instead of Ambiance, which is the default Ubuntu theme for Skype. Next, start Skype and Agree to the license terms. fantastically useful. thanks a million! I also had to remove the .Skype folder in my home directory in order to update. Well done! I noticed that the problem appeared yester 1rst (!!!) of a month. Was too obvious to think of a version problem! i run into the same problem. After installing skype 4.3 as you proposed the skype was able to connect, but failed to load contacts and crashes. thank you, congratulations for this steps. now i have skype in my distro Lmint QIANA. Asante sana – Thank you very much. Worked well on Mint 16. Hi, After having trouble installing, renaming the ~/.Skype folder worked. However, now all the chat history has dissapeared. It looks like main.db has this data in it. Is there a way of recovering this? well, you can paste the content of the .Renamed_Skype_folder/skype_username in ~/.Skype and see if the history gets recovered. I have already copied all the files from the old_skype folder to the new folder. As soon as main.db gets copied across, thats when 4.3 no longer runs, and with it no longer running – can’t check for history. Did not work for me. After installing 4.3, when I type skype in terminal or search for skype using dash I get the start screen for 4.2. sudo apt-get install sqlite3 did not work. sqlite3 ~/.Skype/$USER/main.db puts me into a database program with a command prompt after which I do not even no how to exit. Did you solve that? I have the same problem, after installing the skype 4.3 it opens the very first time, after I close, and then it opens the 4.2. I remove, purged, skype 4.2 but it is still there!!! Same problem as ksanger and tomas!! I tried to run the sqlite3 commands, but in the second one, sqlite3 gives an error message: ‘Error: no such function: instr’ . I tried through adding the Canonical partner repository and it didn’t show Skype after I checked it as a software resource. I really don’t know what to do! I use Ubuntu 12.04 x86_64. I’m looking in Google but I didn’t find any solution until now. Pls, any help is welcomed! I had yet never had any trouble with linux, this time I had. Doesn’t skype usually gets updated by the normal Mint updates? This was 100% helpful. Thx a lot! Thanks a lot for the info. Very helpful and worked nicely in my LXLE 64-bit installation.